Leadership is what one was born with and has learned more in each style. Recession is the failures of leadership, too many Small in Big positions. Gentlemen, male or female, rich or poor, hi-so or lo-so are truly extinct as they set apart from the mean. Think Big, Act Bigger. Do more, Talk less. While, the mean, Act Big, Think Small pays the price to details and picks small to big. The world today is full of rubbish as to get the truth for the mean is the ability to defense the fact. So more and more fact and fat and bigger and bigger waste: Big Talk, Super Credits etc. That’s why the world Gets less, Paies more. High Goal, Right Direction. Balance: Lead and Support. Gentlemen get to the point first & fast and can fight IN or OUT of the systems, while the mean needs credits and more time until more force and fact enough to judge—Which one again and again. So not all followers can be leaders (but leaders are good supporters) and teaching followers to be leaders are wasting like teaching pig to sing a song. Big Heart, Face the Truth. Give more, Take less. While SOB takes Mother/Farther Nature for granted or insults/steps back SOG–Indian or American giving and unashamed Democrat BB (Bean & Buff’)–I know everything— threatened an Angle inspecting their corruption. Gentlemen maybe fooled (เสียหมา) by SOB sometimes but makes amend and develops self soon by facing the truth. If Kings pick kings, the world would be social and economic progression. The ugly truth is the poor together with the cheap, double Rubbish. Long and long, never get the truth, Failed Capitalism/Financial Crisis–promote F(ailed)M, Humanitarian issues–put insulting Right&Law etc. to defense their fear and fool. Pls. 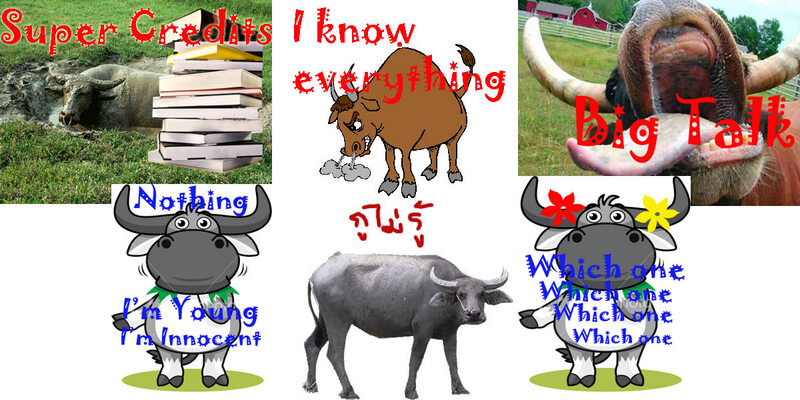 learn more in : It may buffaloes you.